The Ballarat Scottish Country Dance Group meets every Monday night at the Neill Street Uniting Church Hall, cnr. Neill and Macarthur Streets, between February and December under the leadership of Helen Reavey. Normal meeting time is 7.30pm unless otherwise advised and the session lasts for two hours. 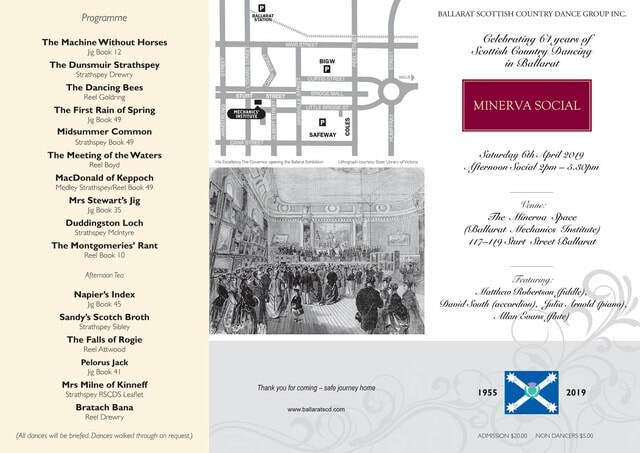 The Annual Social in the Minerva Space at the Ballarat Mechanics Institute from 2 pm. ​ Program to be announced.